Max Miller (Robbie Amell) is a quarterback for the school's football team who once dated Casey McDonald. Max Miller is a very popular kid at Casey's and Derek's school. He is the quarterback for the school's football team, which makes him a jock. Max is also shown to be impolite. He does not act very nice to his girlfriend Casey. Max does not do things that a normal gentlemen would, but when Casey calls him out on this, he acts more considerate. Amy is the school's head cheerleader whom Max dated. 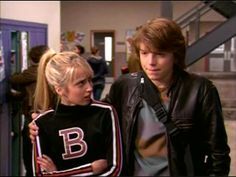 They broke up and got back together constantly until Max broke up with Amy for good to date Casey. Casey and Max start to go out in the episode "Misadventures in Babysitting" after Max breaks up with Amy. They then had a long, solid relationship untill Casey develops mysterious allergies after Max gives her his football jacket. This causes them to break up. Casey later tells Max she wants to get back together but Max had already moved on.